Welcome to the long term computing area of my web site. This area contains details of projects and long term computing interests. The latest news section will now contain details of items of short term relevance. When did I install Windows? (WinInstallDate) 1.5 is now available. When did I install Windows? This application solves that very question. Click here to find out more. 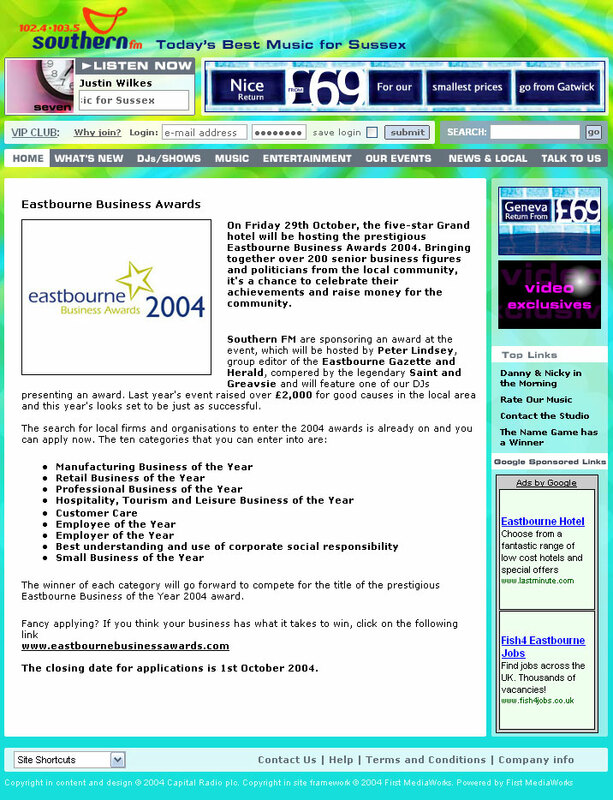 Eastbourne Business Awards Website - During my time working for CMS (GB) Ltd I designed and maintained the Eastbourne Business Awards website. The awards and website were sponsored by CMS (GB) Ltd and I worked on the site to the EBA Steering Committee requirements. The Eastbourne Business Awards and the web site have been advertised on many websites and also in all of the local papers, below are some of the links to this content, stored locally. Classical Music Society (CMS) Website - This is a society of the University of Essex. It was not primarily designed/maintained by me but I was there as an expert to any problems or queries that may of arisen. I helped design and maintain this site between July 2002 to May 2003.
http://privatewww.essex.ac.uk/~cms - This is a link to the current site. Unfortunately I do not have a copy of the site when I was helping to maintain it. Hampden Park School, Eastbourne Website (Now Eastbourne Technology College) - During 1997 to 1998 I designed the Schools first website and although the school did not really have its heart into web development I feel that I was able to produce a reasonable site. Due to the school being renamed the school did not continue to use my design. Hampden Park School Archived Website - I have a permanent archive of this site stored on my own site as the original site no longer exits. Copyright © John Homewood 2003 - 2012.